By working in groups of three we divided and organized the work to be done individually. In my group we have divided the material provided by the NHS, and our researches on the theme of meditation/relaxation during the procedure. After creating analytical charts based on the data, we started the project structurig leaflets, created graphics, icons, choosing colors (color theory), choosing the formats always taking into account a user centered approach. It is important to divide tasks in the group working individually, but always being at the same path. With the final presentation on Friday approaching, all the teams came together to discuss the concepts we all expect to propose. In doing this, we were able to have a clear understanding of what the other groups have done allowing us to prepare a fluid and engaging presentation. We discussed having a timetable for each group to present in a way that everyone has plenty of time to convey the value of their designs. At this stage we are reminding ourselves to have passion and confidence in our ideas. 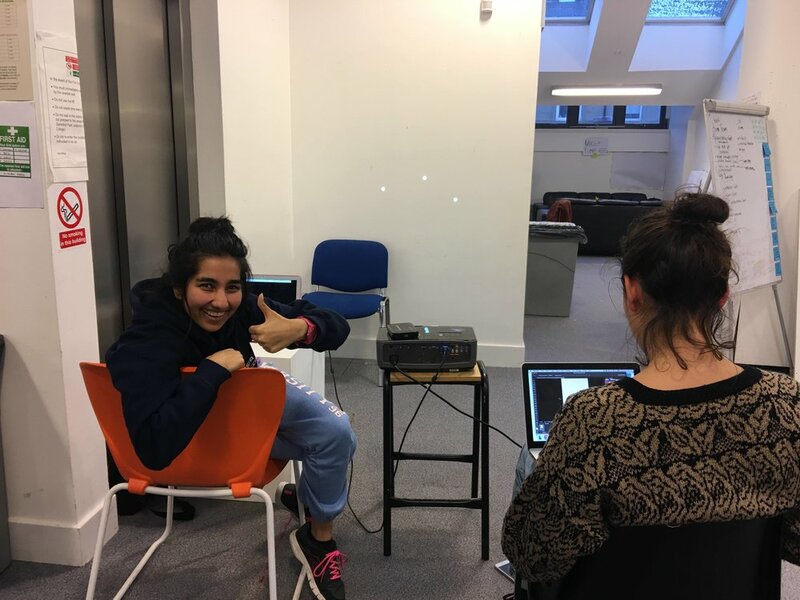 We are enjoying pulling together all of the exciting things about our project..
As we are nearing the end, all the sub groups have been running about trying to add those few magic touches to their final concept, whether it is printing their leaflets, creating floor plans or designing animations. Working with utmost enthusiasm even at this stage, we held a meeting at the end of the day as a whole group, trying to bring together all our parts by discussing about our final presentation. - Collating all our concepts and ideas for friday's presentation. It’s been an intense final week, the rough concepts developed into well rounded proposals with life scale models and working prototypes. A calm but focused atmosphere in the studio stimulated everyone to give their projects a polished finish. Each group prepared for the presentation individually by choosing a narrative and a format that suited the concept. Let’s do this. Team! After 5 weeks of intense work, we finally had a chance to present our final and developed concepts, both to the NHS staff and the other two hospitals groups. Everyone did their best, proposing interesting and innovative ideas that will hopefully inspire the future of the NHS. Looking forward to seeing what the future holds! It is important to show confidence in your own work and be positive when presenting it to a public.